The Rives de l'Aygues, camping with pool in Drôme Provençale offers several ways to spend the night along the river in the heart of the vineyards of Côtes du Rhône, Tulette. You have the choice among 100 pitches, more or less big, more or less shaded, more or less close to the river or the swimming pool of the campsite ... It is you who choose! Also, among these 100 sites planned to accommodate tents, caravans or motorhomes, there are also rentals of accommodation, namely mobile homes, cottages and lodge cabin. Ideal for a family holiday with camping spirit intact! Our campsite in the Drôme Provençale offers you comfortable accommodation. You have the choice between 5 chalets and 3 mobile homes, with separate bedrooms and bathroom, able to accommodate up to 6 people. You can also opt for the charm of this charming overwater cottage called lodge hut. Inquire quickly! 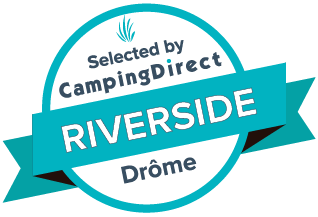 To put your tent, install your motorhome or caravan, Les Rives de l'Aygues, 3-star campsite in Drôme Provençale, presents three types of plots, small, medium and large. All are perfectly integrated with nature and delimited, and equipped with electricity (surcharge).